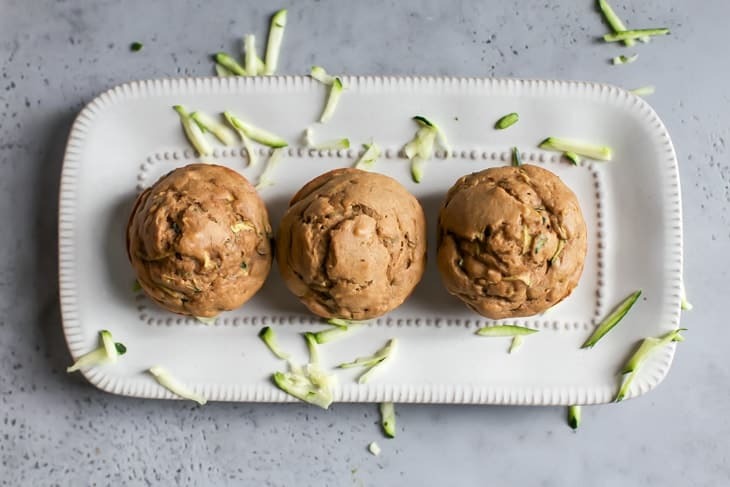 Light and fluffy Healthy Zucchini Muffins! Spiced with cinnamon and nutmeg, made with whole grain flour and dairy-free. They can be made gluten-free friendly using a 1:1 gluten-free all-purpose baking flour. These muffins will be perfect for garden season. 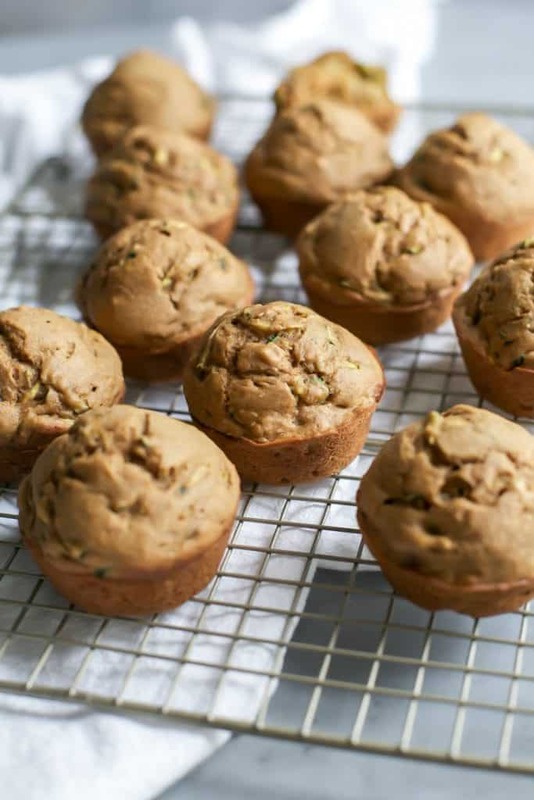 I was going through my quick breads and muffins archive and realized I had yet to bring you a traditional (healthified) zucchini recipe. I have my paleo zucchini bread but no good ole quick and simple, whole grain baking, healthy zucchini muffin recipe. So that’s what’s on the agenda today! But before we start with the muffins, can I just say again how much I have been enjoying this weather lately? I feel like I have to tell you again because it’s really given me a new appreciation for the changing of the seasons. I asked on Instagram last week for people to tell me one thing they were grateful for and a lot of people said “feeling the sun!” and “enjoying my morning cup of coffee outside” and things along those lines. I think for many of us we are just wanting to shout from the rooftops that spring has sprung and we’re all finding different ways to rejoice in Mother Nature. She is a tricky one! 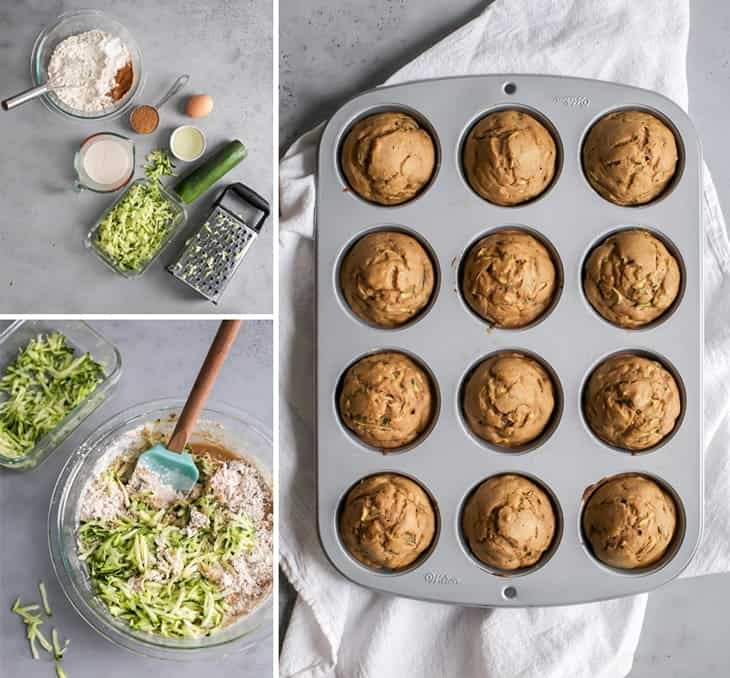 What’s NOT tricky are these lovely healthy zucchini muffins. Seriously so simple. The “hardest” part is grating the zucchini – which tends to find its way to the floor when grating. Thankfully Gilly didn’t mind the zucchini shreds on the floor and picked them up for me. Dog vacuums are the best. Though I do constantly find myself googling if dogs are allergic to chia seeds, poppy seeds, quinoa… basically anything that is super tiny and most definitely on my kitchen floor somewhere at any given moment. But let’s get to it, shall we? 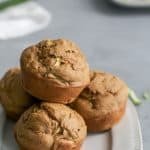 Your standard healthy muffin recipe that happens to be made dairy-free friendly using applesauce and a touch of oil –it really helps with the softness! I like using whole wheat pastry flour for muffins and quick bread recipes but you can also use whole wheat white. OR a 1:1 gluten-free all-purpose baking flour. OR if you only have whole wheat and all-purpose on hand, do half and half. Shredded Zucchini: For this zucchini recipe you don’t have to squeeze out the added moisture in the zucchini unless it is super wet. You can do a light blot with a paper towel if you’re unsure. Quick Tip: I like to use my standard cookie scoop for dispensing the batter – makes less of a mess and it’s quicker! Baking for one or two? I haven’t tried baking a half batch but if looking to do that, I would still use one whole egg and just add a couple more tablespoons of flour (once you’ve cut the amount in half). The sugar: I would use 2/3 cup of sugar as noted in the recipe page but you can get away with a half cup if your sweet tooth isn’t strong. OR you could even add about 1/3 cup mini chocolate chips. I opted for a granulated sweetener here. If you’re looking to use something like maple syrup in place of the granulated sweetener, I would only use 1/3 cup and omit the milk. I haven’t tried that myself but wanted to give you the suggestion in case you’re looking for an alternative. 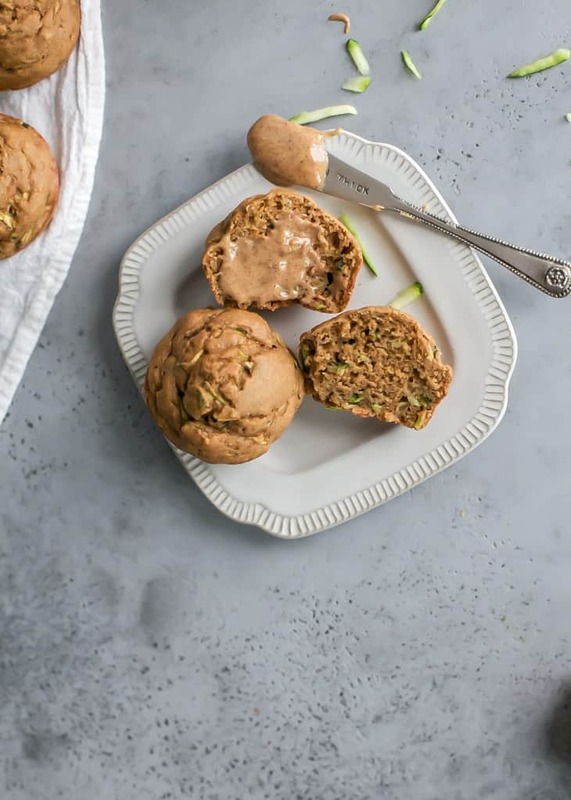 I hope you put these healthy zucchini muffins on your list! They’re soft and fluffy and taste amazing with almond butter! Preheat oven to 425ºF. Grease 12 cup muffin pan with oil; set aside. In a medium bowl add flour, baking powder, baking soda, salt, ground cinnamon, and nutmeg; whisk together until evenly combined. In a large bowl whisk together sugar and applesauce then add in oil, egg, milk and vanilla; whisk until evenly combined. Add bowl of dry ingredients into large bowl of wet ingredients. Using large spatula, gently combine until dry ingredients are *almost* incorporated, then fold in shredded zucchini. Batter will be wet and somewhat thick. Avoid over-mixing the batter or you’ll end up with tough muffins. Evenly distribute batter into greased muffin pan, filling ¾ full (about heaping 1/4 cup of batter). You should end up with 12 muffins. Bake muffins at 425ºF for 5 minutes, then reduce oven temperature to 350ºF and continue baking for an additional 12-15 minutes, or until inserted toothpick in center of muffin comes out clean. Allow muffins to cool in pan for about 10-15 minutes before gently removing. TIP: if greasing pan, I use a butter knife to remove from pan. Transfer zucchini muffins to wire rack and allow to cool completely before storing. Muffins are best enjoyed fresh within 3 days. 1 You can sub 1 cup whole wheat flour and 3/4 cup + 2 TBSP all-purpose flour for half and half, OR whole wheat white flour, OR a 1:1 gluten-free all-purpose baking flour. I did not test this with grain-free flours. 2 You may be able to sub the granulated sugar with 1/3 cup maple syrup, then omit the milk. The muffins won’t be as sweet, or you could keep a few tablespoons of the granulated sugar. I haven’t tested that myself but wanted to give you the suggestion. 3 Banana puree will also work. You can likely sub with Greek yogurt as another option but I haven’t tested myself. Recipe adapted from my Whole Grain Cinnamon Apple Muffins. Can’t wait to try this! I would like to know how many zucchini do you use in this recipe? It’s not posted in the list of ingredients! 🙂 Thanks! Hi Shawna! Thanks for your comment. I meant To add that so will update. But it’s about 1 medium zucchini! I LOVE zucchini muffins! They taste great alongside carrots and butternut squash in pastries–trust me on this one! Anyways, your batch looks absolutely heavenly. Even if it were really really hot or really really cold outside, I’d want all of the muffins you made! Didnt u say these are dairy free? Yep 🙂 You can use a non-dairy milk of your choice (I like cashew) or if not dairy-free cow’s milk is fine too. Eggs aren’t considered dairy, if that is what you’re wondering. I made these yesterday and they are delicious! I made two batches: one I made with chocolate chips. (For the kids), the other I subbed half the sugar for stevia and used 2 egg whites instead of one whole egg. It turned out really tasty. Great recipe!